In order to be able to produce robust linoleum floor coverings it is important that all process parameters are correct. 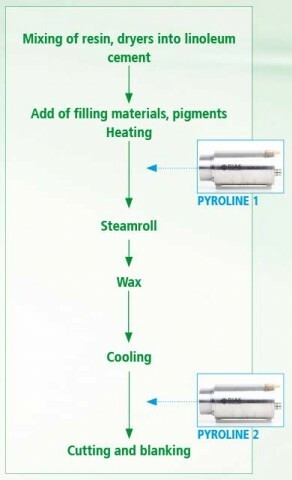 In the first step of production dryers and resins are admixed into linoleum cement that gets heated and filling materials and several pigments are added for coloring. This mixture has to be heated up to a specified temperature range. Because this mixture moves on a broad band coveyor with increased speed a contact temperature measurement is not possible. In the course of a modernisation of the machine old canning pyrometers have been replaced by new, up-to-date infrared line cameras of the type PYROLINE of the German manufacturer DIAS Infrared GmbH. This camera enables a fast, non-contact and high-precision temperature measurement in the necessary temperature range of 100 °C to 200 °C. Average peaks of 4 zones, that are made out of the measured temperatures, are passed to the process control system so the temperature control can be made. In this way the camera is an integral part of a closed loop system which is very important for the product quality. After the temperature measurement raw materials are milled into plates and get coated with hot wax in order to make them robust against mechanical influence. In the next step the coated plates are cooled with spray. Directly after the cooling an additional camera can be used for detecting the temperature and the temperature distributions on the product. In addition the plates are cutted or blanked into the size demanded by the end customer. In the production process of linoleum two DIAS PYROLINE infrared line cameras measure the temperatures without contact. 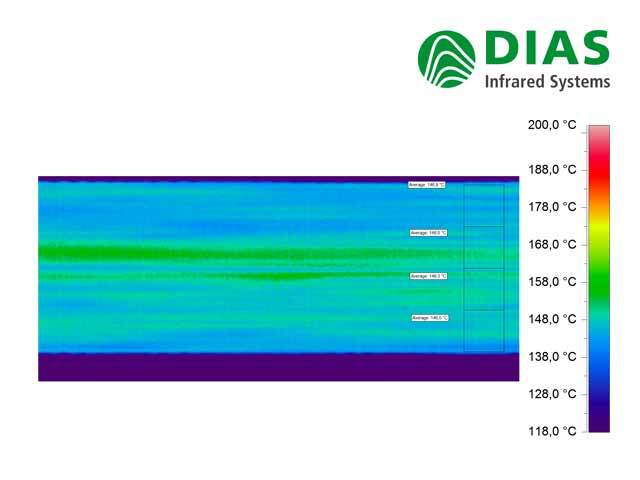 Thermal image of a linoleum plate – recorded with the DIAS PYROLINE infrared camera. 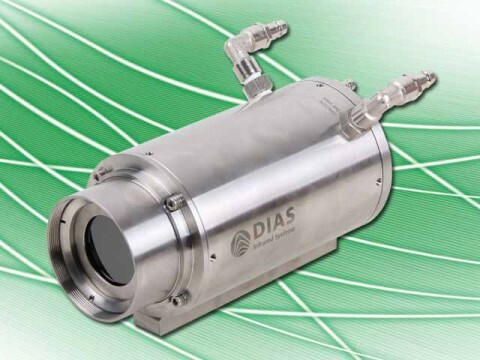 The DIAS PYROLINE infrared line camera in the robust industry protection housing for the non-contact temperature measurement.